Buy 1 for $7.14Buy 2 / Save $0.38!Buy 3 / Save $1.43! A deep red infusion similar to grenadine with a taste close to lemonade. Hibiscus is tangy and enriched with Vitamin C.
In history, every herb and flower has a symbolic meaning. Hibiscus means grace and beauty. 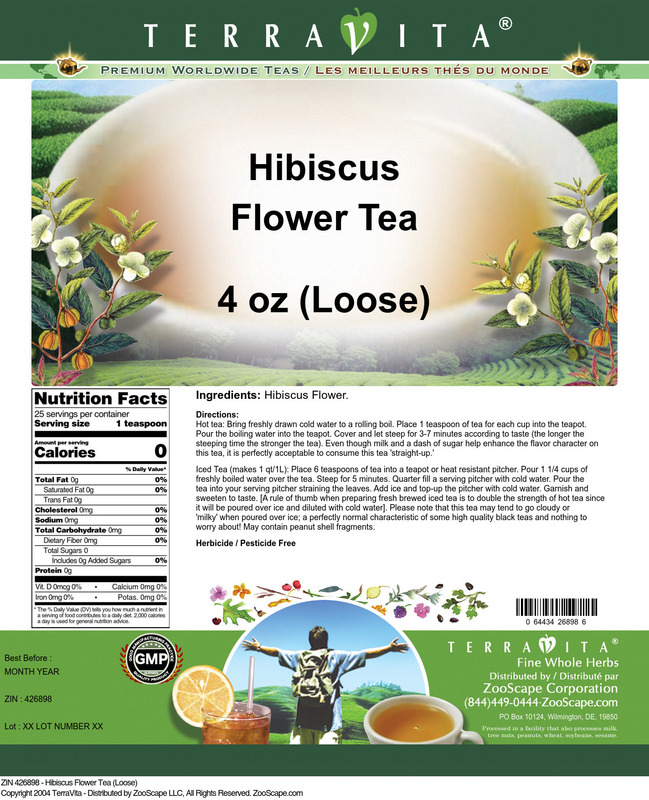 Hibiscus, a native to Africa, is related to a bushy ornamental shrub that decorates many tropical gardens. The calyces which form the outer covering of the flower buds, are dried and used to make a rosy citrus flavored tea. 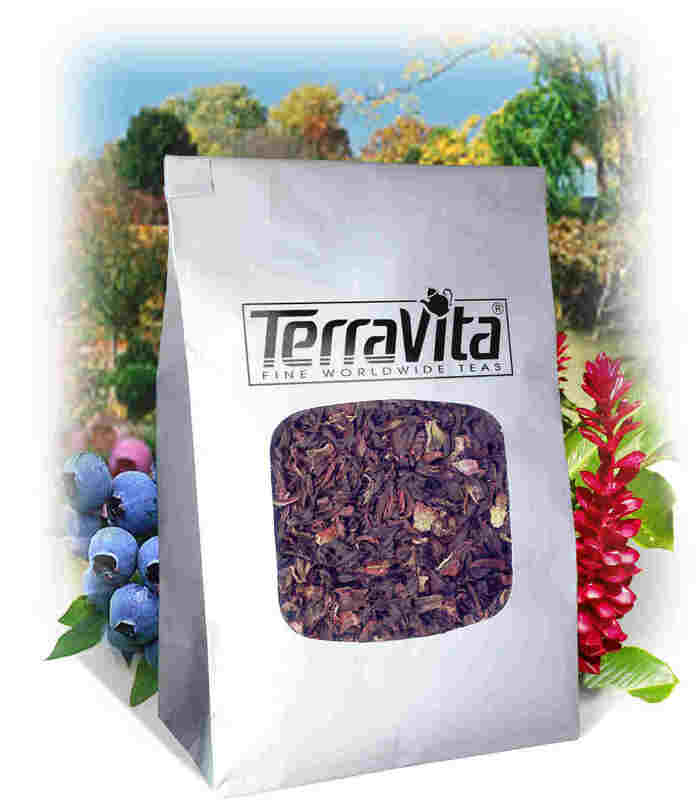 When blended with rosehips and various other dried fruits the resulting drink is lively and fruity. Hot tea brewing method: Bring freshly drawn cold water to a rolling boil. Place 1 teaspoon of tea for each cup into the teapot. Pour the boiling water into the teapot. Cover and let steep for 3-7 minutes according to taste (the longer the steeping time the stronger the tea). Even though milk and a dash of sugar help enhance the flavor character on this tea, it is perfectly acceptable to consume this tea "straight-up." Iced tea brewing method (to make 1 liter/quart): Place 6 teaspoons of tea into a teapot or heat resistant pitcher. Pour 1 1/4 cups of freshly boiled water over the tea. Steep for 5 minutes. Quarter fill a serving pitcher with cold water. Pour the tea into your serving pitcher straining the leaves. Add ice and top-up the pitcher with cold water. Garnish and sweeten to taste. [A rule of thumb when preparing fresh brewed iced tea is to double the strength of hot tea since it will be poured over ice and diluted with cold water]. Please note that this tea may tend to go cloudy or "milky" when poured over ice; a perfectly normal characteristic of some high quality black teas and nothing to worry about! Cup Characteristics: Very tangy - almost tending to be sour. Refreshing with lingering palate cleansing notes.